I wear this lovely jacket almost every day, but I've never post a look with it! I love how the jacket gives an edge to a simple comfy outfit like this one. Definitely a look to wear to the next festival I'm going to! 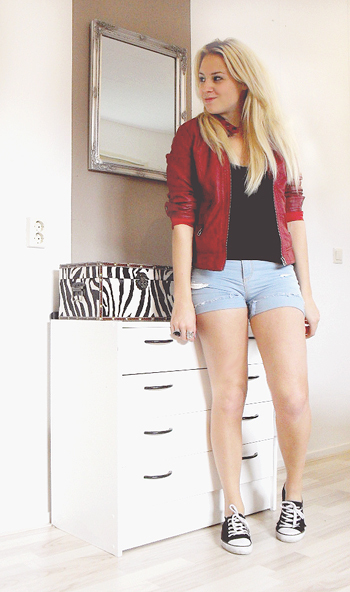 Red leather jacket: Pimkie / Shorts: H&M / Bustier: at a shop called...? LAST DAY TO JOIN THE SILVER GOODIEBAG GIVEAWAY! Leuk zeg! Mooi jasje inderdaad! LOVE it when you wear sneakers! !